The Michigan tradition of “going up north” to hunt, fish and get away from urban living for a bit is more than just a way for Michiganders to unwind. It’s money in the bank for the state’s economy. And we’re talking a lot of money and jobs. Michigan ranks first among the Great Lakes states for jobs created by hunting- and fishing-related purchases, according to a recent first-of-its-kind study by the Eli Broad College of Business and Michigan United Conservation Clubs, with funding support from the C.S. Mott Foundation.Hunting and fishing create and support more than 171,000 jobs and generate around $11.2 billion in economic activity each year, according to the study. That is twice as much as previous estimates from the U.S. Fish and Wildlife Service. Calantone was joined in preparing the report by Shawnee Vickery, Demmer Legacy Professor of Business Administration and faculty director of the Demmer Center for Business Transformation; Ph.D. in Marketing student Joyce Wang; and Master of Science in Marketing Research student Allison Bengal. 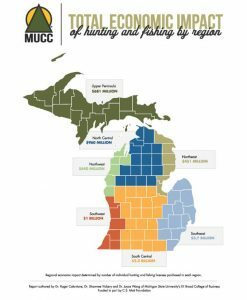 The report is believed to be the most comprehensive effort to date to measure the annual statewide economic impact by Michigan’s 700,000 hunters and 1.1 million anglers, according to MUCC. Those outdoor people drive an economic impact of $8.9 billion from hunting and $2.3 billion from fishing stemming from purchasing gear and clothing, booking hotel rooms, buying meals and such. “We found the (economic) multipliers were a little larger” than those in earlier studies, “and the base amounts (spent) were a little larger,” Calantone said. For example, a Michigander often driving long distances for hunting and fishing getaways would be more likely to buy new cars and trucks and replacement tires more frequently due to their hobby making greater use of their vehicles. “Things like that tend to shorten the cycle or purchases and repurchases,” Calantone said. Every $1 million spent on hunting- and fishing-related purchases in Michigan creates nearly 20 jobs for state residents, according to the study. That outpaced Great Lakes state rivals including Ohio, Minnesota, Pennsylvania and New York (each seeing around 19 jobs created for every $1 million spent), and Indiana, Illinois and Wisconsin (around 15 jobs each per $1 million spent), the study found. Within Michigan, the greatest economic impact derived from hunting and fishing was found in the southeast part of the state (with an impact of $3.7 billion), followed by the south central region ($3.2 billion), southwest ($1 billion), north central ($960 million), the Upper Peninsula ($681 million); northeast ($451 million), and the northwest ($440 million). “The research results reflect that the economic benefits for local communities in every region of the state by those who hunt and fish are vital to continuing Michigan’s prosperity now and in the future,” Amy Trotter, executive director of MUCC, said in a statement. The study is available at MUCC’s Web site.